5220yds done and dusted… Now who stabbed me in the lats? Probably the most overdue “race” report ever, but since I didn’t actually know how I did placing-wise until a few days ago, I feel somewhat justified. During the month of January, swimmers from all over the USA take part in the USMS Long Distance National Championships, otherwise known as the 1hr swim or, more commonly, as the Postal Swim because before the days of the internet, you mailed in your performances to the USMS offices. Unlike most races, where you swim a given distance as fast as possible, the 1hr swim is about how far you can swim for an hour. I have a fair bit of experience with the difference between time and distance based efforts, as we used to regularly do both for rowing (6km & 20min as well as 5min & 1500m). The general consensus on the team is that a timed piece, to borrow rowing parlance, is harder because the clock never budges, no matter how hard you go. With a distance-based workout, harder effort is generally rewarded by getting to the finish faster. While it’s rarely a 1:1 trade-off, going 1% faster takes a lot more than 1% more effort, you still see the very real payoff of your suffering ending sooner when racing against the clock (how fast can you cover a given distance). When racing against the yardstick (how far can you go in a given period of time), your performance is theoretically infinite. Last year, I was 3rd in the 30-34 age-group with 5165 yards. I had three goals for this year. First was to go farther than last year. Second was to break 1:09/100 average. Third was to break 5250 yards (1:08.5 average). Unlike last year, where I started conservatively, this year with some very lofty goals, I started rather aggressively. Perhaps a bit too aggressively, as I really paid the price from about 3,000 to 4,000 yards. I was able to close well, though, and clearly met my first goal, going 5220yds, which also satisfied goal number 2, as that works out to an average pace of about 1:08.9. I came up short of my last goal of 5250, though I still think that was doable with a bit more precise pacing. 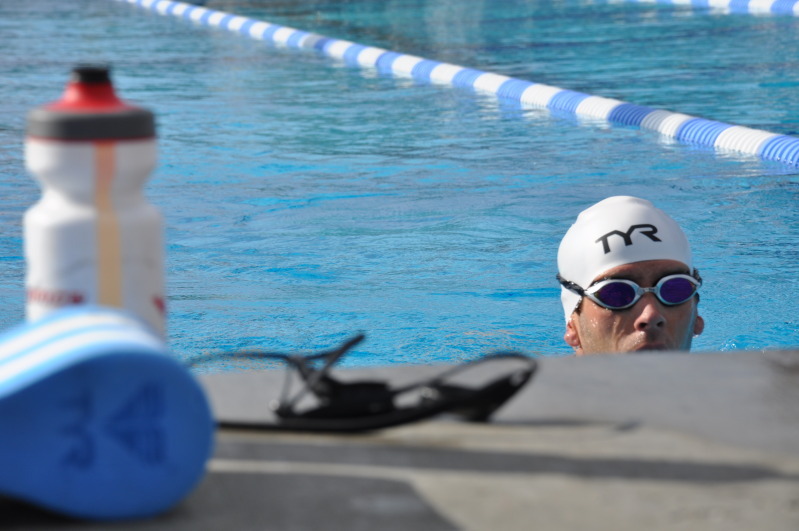 Swimming all out for an hour is a bit like an Ironman, though, in that it’s not something that you can truly prepare for and execute all that often, though it’s more because you really need to put cycling and running on the back burner to nail the hour, and that’s just not practical once the season rolls around. However, unlike last year, I’ve continued to keep my focus on swimming reasonably high, and have logged a lot more mileage since the hour swim than last year, which will hopefully make the improvements a bit more permanent. I missed out on going to Abu Dhabi, but the 200km bike leg makes big volume on the bike a necessity, and I really felt like I needed to invest some serious time in my swimming. Since it takes so long to compile the results, and because you rarely have a chance to actually race the guys you are competing against, it’s a bit hard to set an overall placing goal. It’s also more than a bit of a crapshoot who decides to do the hour swim and how seriously they take it, but I’d be lying if I said I didn’t at least hope to earn a medal like last year, when I got the bronze for 30-34. When the preliminary results came out, I was shocked to see that I was first in 30-34. I was pretty sure that some sneaky fast swimmer was going to come and bump me off the top spot, but ultimately, it turned out not to be the case. It’s not quite as sweet since my total last year would have won the age-group this year as well, so it’s a bit of a case of being the best of who showed up. But, as they say, you can’t win if you don’t play the game. And I’m never one to turn down a victory, especially in swimming where every little trophy feels like a major accomplishment for someone who did not grow up staring at a black line. Thanks to CVMM teammate Dusty “Fastyellow” Nabor for the picture. Man. I did 900y in 15 minutes last week. It wasn't all out, and I'd ridden hard earlier in the day. But still, 5220 is something else. Bravo!